1. As part of the Paws for a Cause program, we will be collecting non-perishable food items for the Principal's Pantry at Copper Hills. Please bring these items to the concert on Thursday. We will be taking cash donations that night, as well. 2. The Battalion Drum Corp will hold a clinic at Copper Hills/West Hills on December 8-9. Since we are hosting, our students have the opportunity to participate for free. All brass, percussion, and guard members who are interested, need to register. Go to: http://www.battalioncorps.org/enlist and follow the directions given. 3. If there are any parents who would be willing to volunteer at any time during these clinics, please let us know. Since we have to go between Copper Hills and West Hills, we especially need 4-5 parents who would be able to transport equipment in their vehicles on Saturday evening around 5:30 p.m. and then back again around 9:30 p.m. Please reply (not to all) if you are interested in helping at any time and we'll get more information to you. The Grizzly Band Facebook page is back in business! Go to the link on the right side of this page to find it. This is now the official page for the band. If you joined the older page--CHHS Grizzly Band :)--it has been archived. Join the group now! Weber State University is hosting an honor band on Feb. 16-17, 2018. This is another good opportunity for our band students to learn and grow as musicians. The cost is $25 per student which includes Saturday lunch and drinks. Money is due at check in on Feb. 16th. Since this is not a school sponsored function, your child would be responsible to get themselves up to Weber State on Friday and Saturday and for any overnight accommodations if desired. Mr. Matthews would like to open this up to all band students who are interested. However, we have been asked to send only 15 students. 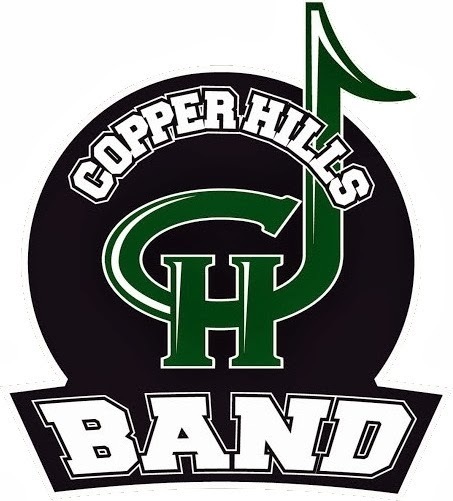 That said, if your child is interested, please send an email to copperhillsbandboosters@gmail.com by January 5th. They will be notified if they made the final list by January 10th. Please make sure to include your child's full name and grade. All CHHS band members and percussionists (grades 10-12) are invited to go on tour this year! We will be heading down to Anaheim to have a bit of Disney fun! Our group has been approved to play on one of the Disney stages and we will be doing a fun soundtrack workshop, which will teach the kids about the world of professional sound studio musicians. Please send at least one parent from each family. Even if you know your child isn't going on tour, please come and give approval so the rest of the kids can go! There is another opportunity for our students to participate in an honor band this year. If you are interested, please follow this link: https://www.suu.edu/pva/music/honorband/. Follow the directions given in the link to submit an audition and fill out the registration form. This is an individual event and students who are chosen to participate are on their own for transportation, lodging, and food.